Geneva Mechanism by Nordex, Inc.
A Geneva Mechanism produces intermittent rotary motion. There are Intervals of motion and rest. The pin on the drive wheel moves into the slot of the driven wheel advancing it by one step. The Driver then rotates while the follower stands still. Found in indexing equipment, automated devices. Koepfer America offers used mechanical and CNC gear hobbing machines ready to ship now. These machines are fully recertified and feature automatic loading, crowning, hob shifting, and more. Talk to us today about a value-oriented, flexible hobbing solution that packs more technology than you might think. A manufacturer of Aerospace-grade fasteners wanted to streamline their production process and shorten lead times while still keeping costs low. 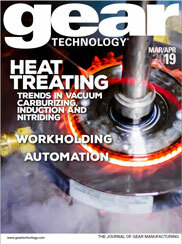 They realized that to meet their objectives they needed to bring heat treatment in-house. However, this would be their first vacuum furnace. Discover their winning outcome. Gleason's new 300GMSL Multi-Sensor Gear Inspection System includes the classic tactile probing methods for inspecting conventional gear data on spur and helical cylindrical gears as well as straight, spiral and hypoid bevel gears with a diameter of up to 300 mm. In addition, the system allows non-contact laser sensor scanning of tooth flanks to support gear development.